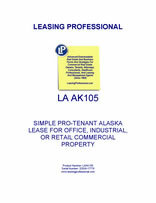 This form is for a single tenant Alaska lease where the tenant has superior leverage. It gives the tenant the right to use the premises for "any legal use," and has very abbreviated remedies for the landlord in the event of a tenant default. It is also pro-tenant in character because of the clauses it does not contain which customarily appear in pro-landlord forms relating to remedies and a variety of other pro-landlord provisions. Alaska was second only to Hawaii in becoming a US State in 1959. Alaska is the largest state in the US in terms of land area, but the habitable regions of the state are limited by massive glaciers, ice fields and protected wilderness habitats. Alaska's massive natural resources are managed by a government organization through the Alaska Permanent Fund which invests a portion of the revenues from resources such as oil, timber & mining back into Alaskan public works. Alaska's economy centers around the extraction of natural resources, including the Trans-Alaska pipeline, which provides almost 10% of the petroleum consumed in the United States. Freighters, tankers & planes provide much of Alaska's transportation, although road systems connect to the Canadian highways, allowing vehicle access from the lower 48 states. The majority of commercial real estate leases in Alaska relate to office buildings, shopping centers, industrial properties, and other commercial real estate located in Alaska's major cities, which include Anchorage, Fairbanks, Nome, Barrow, and Juneau.